Best of the Best - Gorg Bridal Maangtikka Designs We've Seen on Brides! Maangtikka’s – the crowning glory of any bridal jewellery set. No matter what the style, whether dainty or big, round and bold, bridal maangtikka designs never fail to leave us with a wide-eye-wonder! Made popular by the Punjabi brides in our real weddings section who rocked bridal maangtikkas in designs ranging from over-sized danglers, to polki studded beauties and some adorned with pretty white pearl detailing too. This piece of bridal jewellery has the versatility to compliment any bridal ensemble – whether a bold maroon and gold lehenga or a peachy-pink sharara, no matter what the tone of your bridal wear is, this piece of jewellery can never do you wrong. Best styled with an updo with flowers, a bridal maangtikka can add magic to your entire face when complimented with the right makeup and hairstyle. Drawing inspiration from these gorgeous brides we’ve curated a list of the most stunning bridal maangtikka designs we’ve seen on our Real brides. 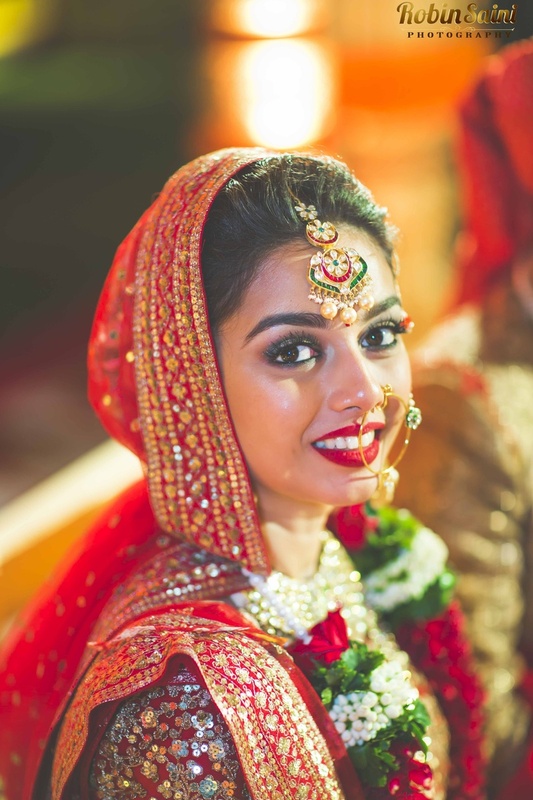 Whether Punjabi, Marwadi, Gujrati or Muslim a bridal maangtikka added to your wedding jewellery will take your entire look a thousand leves up! The Beauty of Fuchsia and White! That minimal meenakari detailing is just plain stunning! Mini Gold Chaandballi Style for the Swagger Bride! Punjabi Bride Goals Right Here - Don't You Agree?! Our Endless love for Jadau Maangtikka's like these! When Our Brides say Over-sized Maangtikka - They Mean Over-sized Maangtikka! Another Stunning Punjabi Bride ruling the Polki Chaandballi Maangtikka Look!